Another leaked second-generation iPad case from overseas shows a large opening on the lower left side of the back of the device, this time with an illustration of a speaker grille. 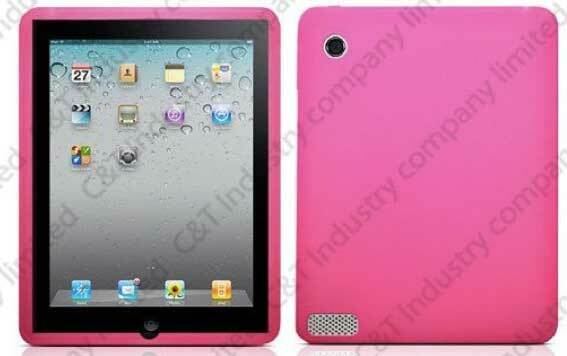 Alibaba.com, a global online business-to-business trading platform, is currently offering silicon cases for the "iPad 2." Like previously revealed cases, these have a spot on the back for a camera, as well as a hole in the bottom left rear side. While a previous report suggested the space would be home to an SD card slot, a new report from this week said that the new iPad would instead have a wide-range speaker on its back side. It also said the back of the new iPad would be "flat like an iPod touch." The latest case has an illustration with a speaker grille in the spot on the back, lending support to the rumor that the next-generation iPad will have an improved speaker. It was said the speaker on the back side is covered with a "metal mesh." The previous report also alleged that the new iPad will retain the same 9.7-inch LCD display, but the device will be 3mm smaller, measuring 239mm by 186mm. It also said that the ambient light sensor in the new iPad will also be moved to the "upper center of the rear panel." The new iPad is expected to have dual cameras, with a forward-facing one to be used for FaceTime video chat. FaceTime debuted this year on the iPhone, and eventually came to the new iPod touch and Mac OS X. Reports have claimed that production of the new iPad is underway and overseas suppliers will begin shipping the device to Apple in January.